One of my favourite carols, in remembrance of Mr. Borov, my grades 9-10 Spanish teacher, from whom I learned a love of languages, music, and seeing beyond the sphere of my own isolated and provincial world. I remember a Christmas assembly where students and staff performed for the entire school during an afternoon. There were the usual silly skits and loud garage bands. And then Mr. Borov, a small man, barrel-chested, porcelain skin and dark hair, took the stage and stood alone under a spotlight. The audience was rowdy. Unabashed, Mr. Borov opened his mouth and, a capella, sang O Holy Night. From that first, clear, unwavering note he had us and brought us to epiphany, so that when at last his voice soared through those last crescendos we were on our feet, weeping, cheering, clapping for the beauty of this simple man’s gift. What does this have to do with writing? Probably not much directly. 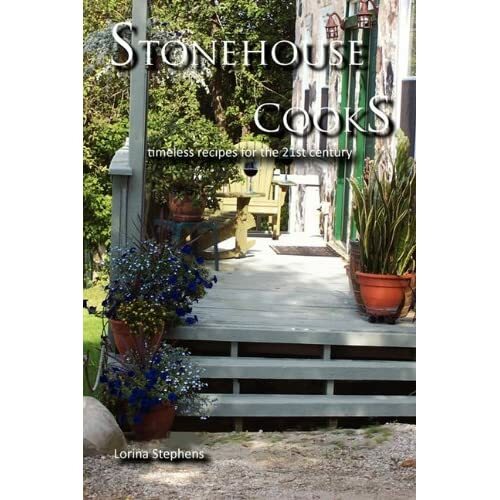 Having said that, I have published two cookbooks, the most recent of which is Stonehouse Cooks. And as an adjunct to that I find kitchen therapy, well, good therapy. Take today, for instance. It's been a day of frustrations, between trying in my role as publisher at Five Rivers to edit, save and upload an interview I did with Patrick Lima, author of The Organic Home Garden, juggling scheduling problems in my role as administrator for the glass end of Five Rivers, and generally combating my usual seasonal disorder having to do with lack of sunlight, being a natural recluse (my own choice, I assure you) and this consumer-glut-fest they call Christmas. So, it's dinner time. I knew vaguely I was going to make some sort of mac and cheese (see my cookbook above), found myself short on milk, long on stock, a surfeit of frozen greens, and a modicum of creativity. The result? A really yummy cold weather casserole that requires a wee bit of time, but not much, and will prove to be economical as well. Bring a large pot of salted water to a boil and cook the rigatoni about nine to 11 minutes, until it's just underdone. Drain and set aside. Mix together all these ingredients in a greased or non-stick 4 litre oven-proof, lidded casserole dish. Add the drained pasta, mix and set aside. In the same pot in which you cooked the pasta, melt the margarine over medium heat. Add flour and stir, allowing the mixture to bubble but not scorch. Cook, stirring, for about one minute. Add the stock slowly, stirring well, to avoid lumps, but truly it doesn't matter that much, because you're going to bake this and any lumps will get lost in the mix. Once the mixture thickens slightly, add the cheese, and continue to stir until the cheese in melted. Pour the sauce over the pasta. Stir together. Sprinkle bread crumbs and flax seed over the top of the pasta. Cover the casserole with a lid and bake in an oven preheated to 400F degrees about 30-45 minutes. Thought I'd offer my readers a wee Christmas garland of three short stories this year I wrote over 20 years ago, which came about in part to chronicle some of my mother's childhood experiences entitled Memories, Mother and a Christmas Addiction. They're sort of Rockwellian vignettes with what I think is a very Canadian overtone. The first, Santa and Mr. Buck, captures the excitement of four year old Barbara Brown on Christmas Eve, and her meeting with Santa, only to discover she missed out on the best part of all, holding Santa's reindeer with her father. The second, The Year Santa Didn't Come, is an exploration into the pressures of poverty on a family at Christmas, and the true meaning of sharing. The third and final story of this small collection, A Christmas Promise, tells the tale of Barbara Brown's first Christmas without her step-father, who died earlier that year, of how she overcomes the pressures of being a wage-earner at the age of 15, while still keeping a promise she made to her step-father. Memories, Mother and a Christmas Addiction is now available through Amazon's Kindle, as well as Smashwords, and hopefully before Christmas from Kobo, Nook, Sony, Apple and Diesel. Hope you enjoy this wee seasonal read. Perhaps it's my seasonal dysfunction, lack of light; the month of mayhem and rampant consumerism and delusional dreams of Rockwell realities. Perhaps it (my cynicism and raised eyebrow) is nothing more than a passing malady, like indigestion or flatulence or that plague that everyone south of me seems to suffer. Today's grump is about marketers, self-proclaimed experts who mouth buzz words and scry trends in the entrails of the day's news, declaiming that they, and only they, can reveal the path your fortune will walk, Grasshopper. There is a veritable infestation of these types on Twitter, Facebook, LinkedIn and other social media, all of them madly clicking away to befriend/link/associate/buddyup/whatever and sell you their brightly painted nuggets of marketing sophistry. Query most of them as to what, exactly, they can do for you and your career, and you'll often receive an inscrutable response. And of course the overall question must be: what makes you an expert? Oh, you've self-published several books about self-publishing, which you then sell mostly through lectures you coordinate and teach to local writer's groups. Put enough spin on something and I'll bet you could sell a bottle of water as a miracle cure. Or maybe those shiny, plated Celtic-Romano style bracelets that will align all the magnetic fields in my body and cure my arthritis. And have you ever noticed how all these marketing types have that retina-searing smile of perfectly manufactured teeth? Makes me feel like I'm looking into the mouth of some new hybrid wolf, but at least the wolf would have the honesty to let you know she's having you for dinner -- NOM, NOM, NOM -- instead of promising you possession of the Holy Grail which you'll be too anemic to grasp after she's done with you, should you ever find it. So, I suppose my overall caveat is this: carry with you a healthy skepticism. Find out exactly what a person or firm is trying to sell you, whether it has to do with your literary career, or home renovation. Ask for credentials and then check out those credentials. Get a written quotation as to exactly what remuneration the firm is expecting for exactly what services. And then shop around and compare. Just because someone has published books on a subject doesn't make them an expert.